Gareth Southgate was able to oversee a full squad training session as England reported no new injuries ahead of their trip to Montenegro. After having to deal with various withdrawals since the squad was announced, Southgate saw all 20 of the remaining players train at St George's Park before flying to Podgorica on Sunday afternoon. Tottenham midfielder Eric Dier had become the latest casualty when he suffered a muscular problem in Friday's 5-0 win at home to Czech Republic. The England manager said that fans should be able to behave themselves at matches and enjoy themselves without the assistance of security. Gareth Southgate has suggested it is a 'hugely exciting' time to be England manager despite Man United speculation. England boss Gareth Southgate has called on clubs to prioritise young, homegrown talent in bid to improve the international side. 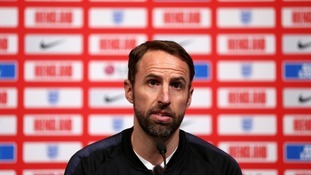 England boss Gareth Southgate is eyeing a golden era for his young side as inevitable expectations increase in the build-up to Euro 2020. The England manager encouraged young people to try new things at the launch of his new 'We Only Do Positive' handbook. Gareth Southgate is ready to drop the age of England's "youth club" even further in the pursuit of progress and success.